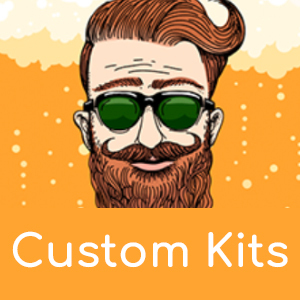 The Fast Ferment Wine Starter Kit is a great gift idea for anyone that is interested in getting into home brewing of quality beer, wine, cider or mead. Studies show that only a small percentage of new brewers stay with the hobby for more than a year due to the amount of equipment necessary in traditional brewing and the amount of work it takes to rack, transfer and clean all the equipment. 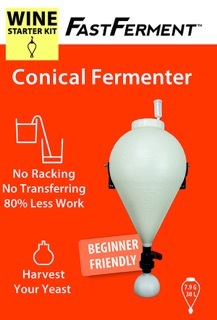 The FastFerment Beer Starter kit replaces buckets and carboys, drastically reducing the amount of equipment necessary to complete a batch of beer and therefore reducing the time and work involved in both the brewing and cleaning processes. The FastFerment system is a one-stage fermenter that allows homebrewers and winemakers to use the same unit for both primary and secondary fermentation, making it more sanitary than conventional bucket fermentation, and results in cleaner and purer homebrew beer and wine. Unlike primary fermentation in a bucket or a carboy, which allows your product to have 100% direct contact with the dead yeast and sediment at the bottom, the FastFerment features a 1" ball valve mechanism that reduces contact with sediment by 99%. When fermentation is complete, the ball valve can be closed, and the collection ball containing the sediment can be removed.